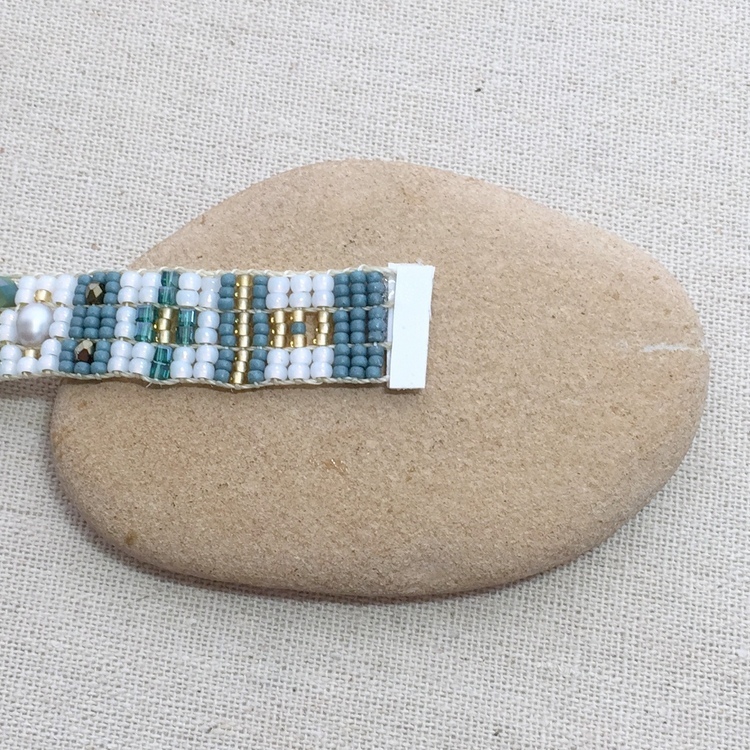 I promised a story about the other loom beaded bracelet I made last week - what I consider an Adonnah Langer (or Chili Rose Beadz) style loomed bracelet. I'm sure there are many other people who have done this style of looming, but she is probably the most famous for it at the moment. 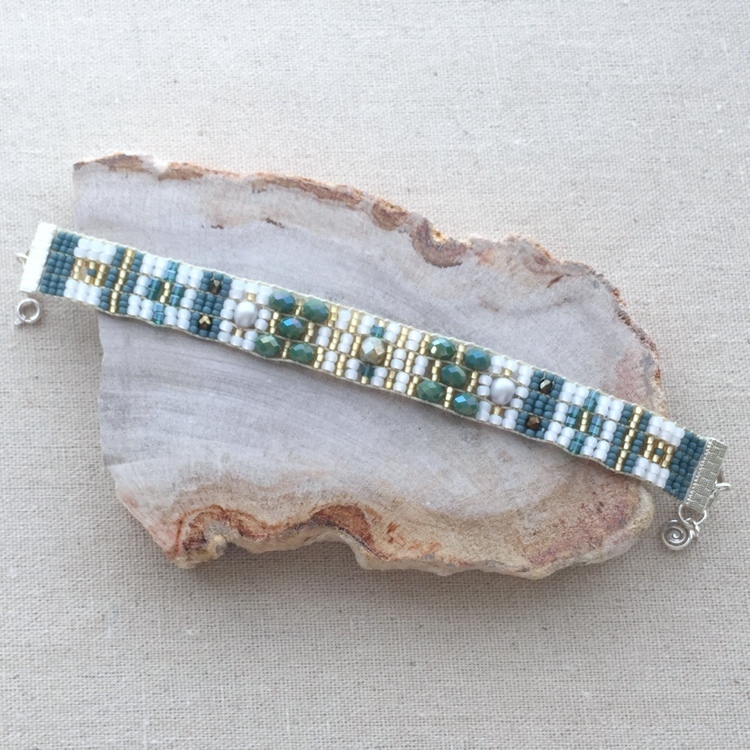 It uses a combination of seed beads and Czech crystals of varying sizes. Ugh! 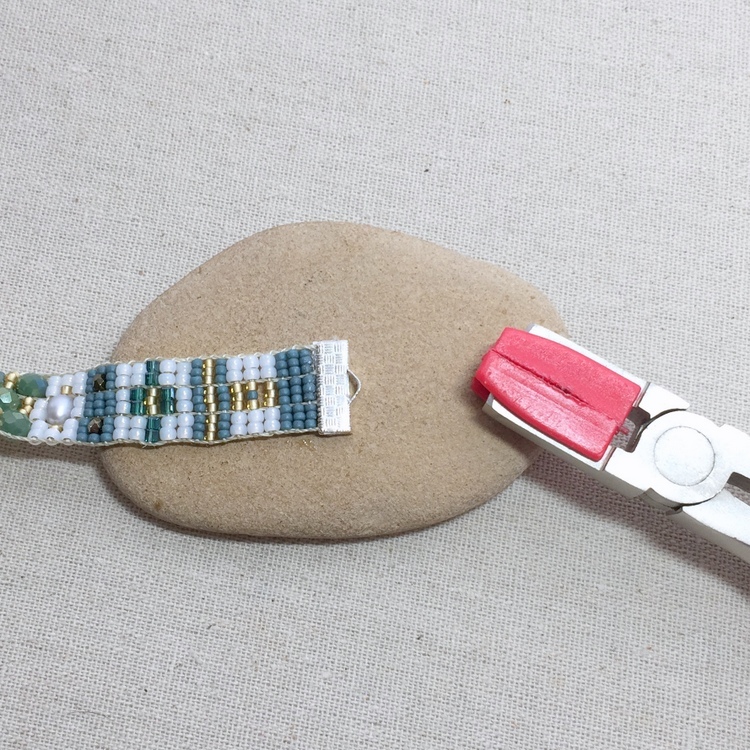 The woven and glued selvage pulls apart from under the ribbon clamp! That leaves me with tiny nubs of warp thread that are too small to weave in and a short strand of weft (weaving) thread. There's really no instructions on how to fix this - and most people might just chalk this up to experience. But I'm not willing to part with this bracelet that easily. The only solution I can think of is to wrap the warp threads in something and try the ribbon clamp on that. First, I weave in the weaving (weft) thread end which is barely long enough, but I manage to get it woven in to the bracelet and secured. 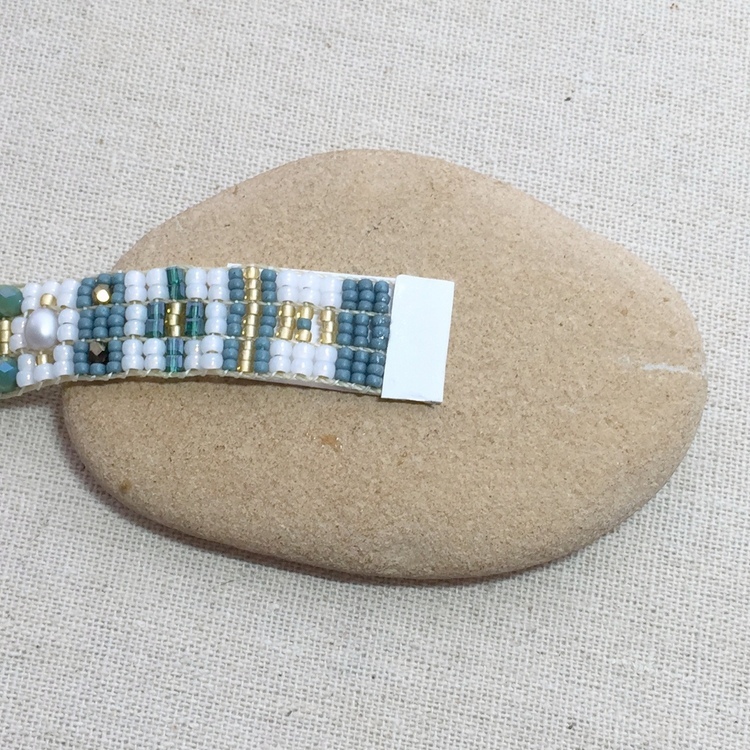 Next, I find some slightly thick white paper and cut it to the width of the bracelet. I figured if the E6000 glue is what you should use to hold a woven selvage in place, why wouldn't it hold the warp threads in the paper? I spread the E6000 on the paper and make sure I push the warp threads in from the edge. 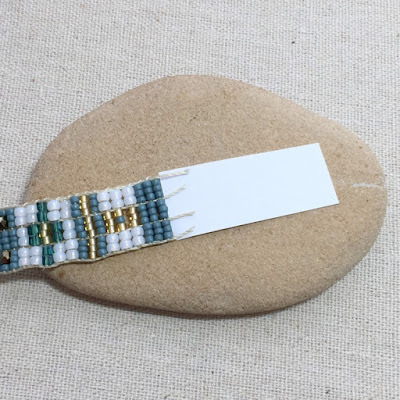 Next, I fold over the paper end and trim it so it ends right next to the beads. 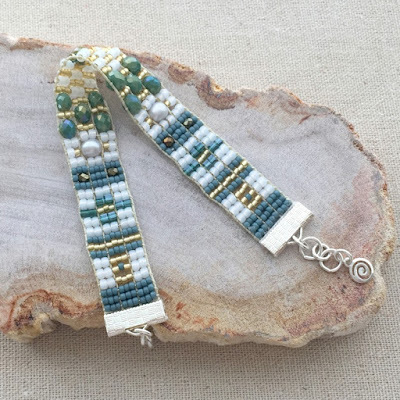 The other side is already aligned with where the bead weaving starts. I made sure that I pressed it very flat and that the glue, paper and threads were all in tight contact. No air bubbles or gaps this time! Once it is dry, I trimmed the paper (and threads) so that it will fit back in a ribbon clamp. I close the ribbon clamp using plastic covered pliers, to avoid denting the ribbon clamp. Oh yeah, I did add glue to the inside of the ribbon clamp - just so everything stays in place. I'll let you know how it wears - but for now, it has passed a pull test. The pull test, if you don't do it, is my standard test for all new jewelry and how the last one broke. 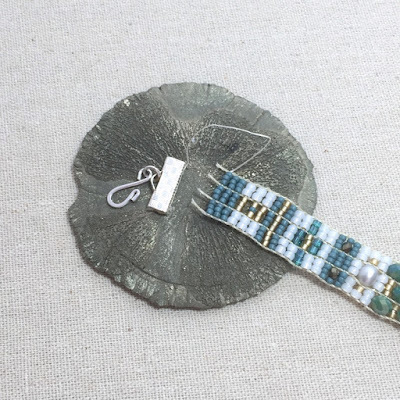 Once you finish, give it a firm and steady pull on the clasp ends. I don't yank it - just a firm pull, as if your wrist caught on something. 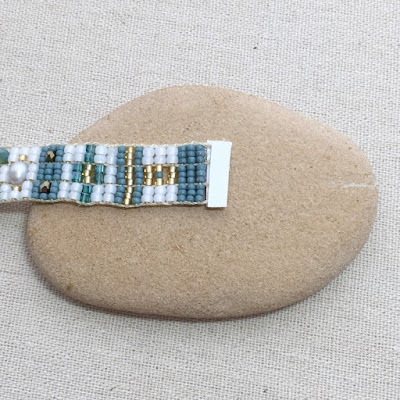 In the details of saving the bracelet, I forgot to tell you how much fun it was to make the bracelet! My mirrix loom was set up with 4 warp threads in C-Lon cord. The beads are a variety of different sizes and shapes, so before I could make the bracelet, I had to decide the equivalent sizes of each type of bead so they would all fill the warp space evenly. 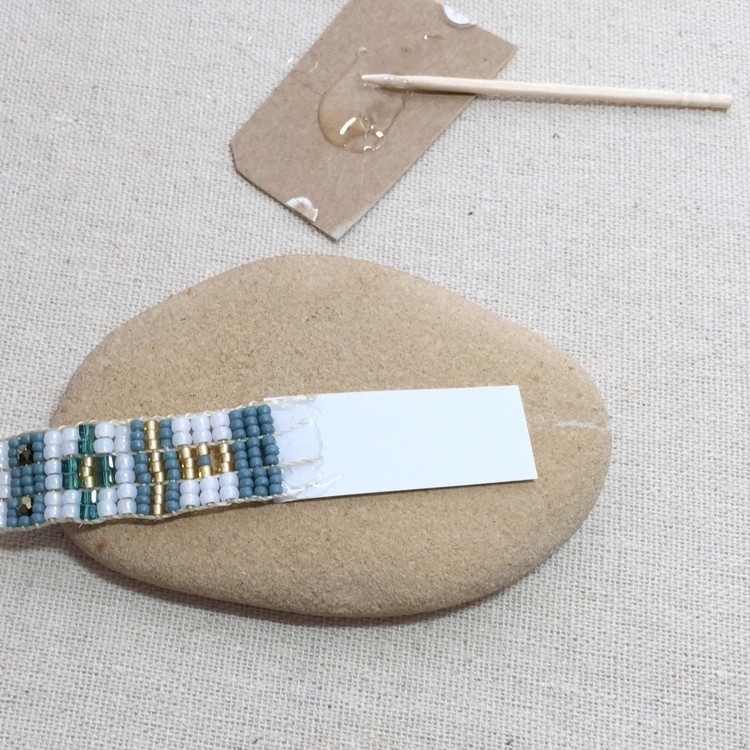 And then I also had to try to make sure the beads would fill the gaps around the larger beads. I likened it to the game Tetris, where you flip blocks to fill in a grid. I enjoyed it a lot - and will make another one soon. As always, you can be notified of my new projects by following me on one of these fab social media sites. I have some cheap ribbon I glue over the woven end (also with E6000) before putting the ribbon clamp on. I think this was recommended in the companion book to the Jewel Loom (not part of the kit with the loom, but purchased separately). My ends look somewhat ugly right now simply because this is a new skill for me, but nothing is falling apart (yet). I think I may start trying this too! Thanks for letting me know it works. Lisa, you could weave in more thread with a needle further back in your beadwork then reattach to your loom and lengthen with more beads... that would make a strong repair but take more time. Your blog is fab - I love it! Now why didn't I think of that! If I notice this coming apart, that will definitely be what I try next. Thank you!! What a great, creative solution to a tough situation - you probably just saved lots of people's bracelets (and sanity)! Saving my own bracelet (and sanity) was great, and if it helps others, all the better! Thank you! I will try that. 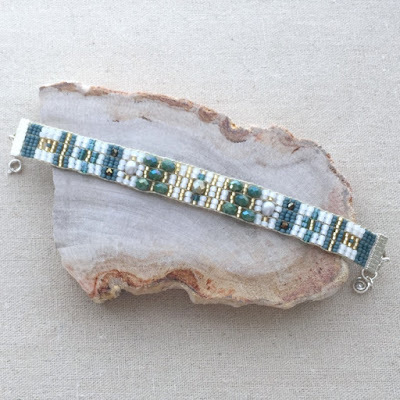 Hi, I really want to learn to make the Adonnah Langer type bracelets. Are there any books or online tutorials you can recommend? 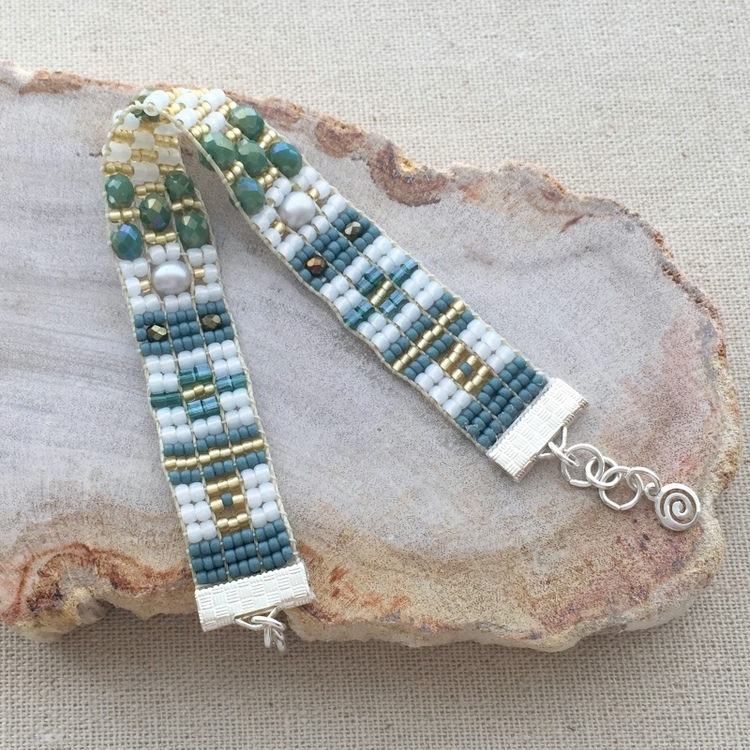 I'm pretty new to loom beading...not even sure which brand loom to buy. I returned the Clover because those little teeth were so close. I suppose I could have skipped some, but I wasn't too sure what to do. Advice?